Bring a pot of water to a boil, add the pasta and cook till al dente. Add the peas to the colander and pour the pasta and water over them. Rinse well with cold water and shake the water off. 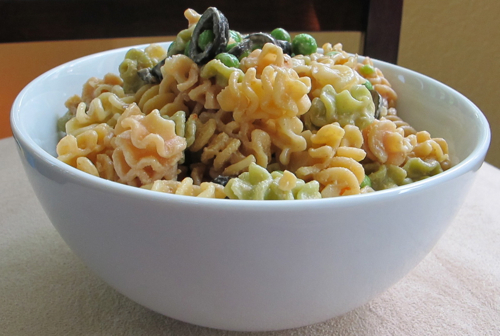 In a large mixing bowl whisk the dressing together, add the pasta, peas and the olives, stir to mix.